Many cities around the world are still protected by the old city walls built centuries ago. Though not much of a defense mechanism today, these walls are kept as a remembrance of the past and often they serve as a tourists attraction. If you’ve ever been to such a city, you know there’s nothing like walking around or on the walls of an ancient town to really understand it. The walls of this beautiful city in south Croatia were built during the 14th century and the 15th century and were extended till the 17th century. 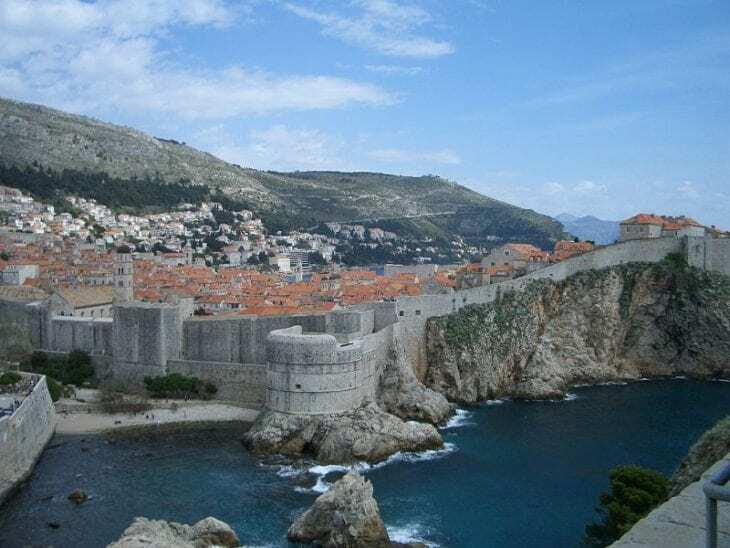 The walls of Dubrovnik were never breached and they did withstand a major earthquake during the 17th century. Today tourists from all over the world come to walk the famous city walls on the 2 km trail. An ancient cathedral city with a history that dates back to before Roman times. York is also one of the best preserved cities in Europe. It has been protected by walls since Roman times, and the walls we see today around the old city date back to the 12th century until the 14th century. The walls we see today around the old city of Jerusalem were built in the 16th century by the Ottoman empire. Those walls were built over previous walls that protected the city since ancient times. Click here for a list of the best attractions in Jerusalem. This beautiful small coastal town in northwestern France is surrounded by walls which, along with the impressive tide and the Chateau are the city’s best attractions. The walled city is quite small in area and is easily covered on foot. Dating back more than 3,000 years, Xi’an is one of the oldest cities in China. Its existing walls date back to the 14th century when they were rebuilt during the Ming Dynasty. The walls around the city are not only one of the best-preserved city walls in the world, they are also one of the biggest with 14 km long, 12 meters high and a thickness ranging from 12 to 18 meters. Either than holding one of the most beautiful castles in the world, this UNESCO world Heritage site is also a walled city. The countless tourists that visit Mont Saint Michel enjoy walking behind the ancient walls that protected the island from enemies for centuries. England made repeated failed attempts to capture the island during the Hundred Years War. They were unable to breach the fortifications and two of their wrought iron bombards that were left behind after a siege in the 15th century are still visible near the outer defense wall. This 14th-century walled city is a UNESCO world heritage site. The 6 km long and 12 meters high walls around the city, along with some 72 (!!) watchtowers also date back to the 14th century. This walled city in south-west France is a UNESCO world heritage site. Also considered as one of the best preserved medieval cities in Europe, the city is now the destination of many tourists that come to see the historic fortress, the Basilica, the walls and much more. The walls around Taroudant were built in the 16th century by the Saadi Dynasty. The 6 km long walls encircle the town to this day.